Update 8/13 9:30 p.m. — The large column of smoke seen Monday afternoon was from a spot fire over the line on the west side of the Cache Creek Fire and burned in the bowl east of Battlement Reservior Road, according to the latest from the federal incident command team. Prior to the spot fire, containment was at 60 percent and acreage had grown to 1,717 as of Sunday. Crews were able to contain several spot fires near the line, according to the update. Weather forecast: Widely scattered storms are expected in the area with temperatures in the 70s and 80s and relative humidity in the upper teens to near 20 percent. Outflow winds are possible from area storms. Showers and storms are more likely on Tuesday and Wednesday. August 12: Firefighters concentrated their efforts in patrolling the fireline to watch for spot fires especially near the burnout operation conducted Friday evening, according to the latest update from the fire management team working the Cache Creek Fire southwest of Rifle. The two crews patrolling and monitoring the fire were able to contain several spot fires near the line. Containment is now 60 percent and acreage remains at 1,611, although this will probably increase after our next infrared flight. A number of resources were sent to assist with the Cabin Lake Fire. Today, crews will continue working to strengthen the line and watch for spotting across the line. August 11: Firefighters conducted a 15-acre burnout operation on the southeast edge of the fire to strengthen the containment line. According to a Saturday update from fire managers, a 20-person crew assisted the Smoky Bear Hotshots in patrolling and monitoring the fire along the containment lines before the burnout operation. Containment remains at 56 percent and acreage increased to 1,611. Today crews were to continue working along the east side of the fire to strengthen the line and watch for spotting across the line. Three engines and helicopters are available to assist with firefighting efforts. 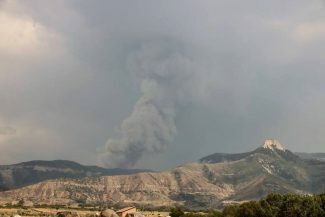 The fire has been burning about 8 miles southwest of Rifle since the evening of July 28. An official cause has not been released by fire management officials. Areas near Battlement Reservoir Creek Road remain on pre-evacuation notice, but no structures have been lost to the fire. An emergency area closure remains in effect for parts of the Rifle Ranger District of the White River National Forest.